Spearmint, bubble gum, caramel, honey , iodine and smokey goodness! Smooth, rich and creamy. Sweet summer strawberries come through with cherries, sherried oak and prevalent peat and smoke. Relatively short to moderate. Some pepper notes linger. A splash of water improves the experience. A malt made for a rainy day in autumn. Very inviting nose, nice contrast of sharpness and fruitiness on the tongue, a finish as an echo of the palate. How beautiful, maritime notes. Salzgeschwängerter wind at the sea, cooling. The smell of wet sand. Fresh sliced ​​apple, red grapes. It is warming, slightly smoky, leather notes are mixed with vanilla pods with pepper. A compote of black cherries. Creamy, almost creamy, and with a lot of volume on the tongue. Peppers sharpness. Very mild peat smoke, oak pieces. Also pleasantly salty on the tongue, the initial pepper is still present and gives off a good pick-me-up. In addition, cherry flavor, raisins, dried apricots. Dark chocolate and aged brittle leather. Medium length, spicy, tart and fruity, not too dry. A tingling sensation on the tongue as a reminder of pepper & salt from the nose and mouth. Sweet and malty. Perfumed leather. Campfire smoke, scented candle. Sherry with prunes. Some smoke, pepper, ham. Malty. The stunning nose was very promising, but the rest could not deliver the same spectacular high level. Still a very good dram, mind you. The sherry has had it's effect, this smells deliciously umami: salt, sweet and sour (fermented grapes). Furthermore, there is soft vanilla and wood shavings, moist sultana cake, prune, apricot, moist peat, wood smoke and salted almonds. 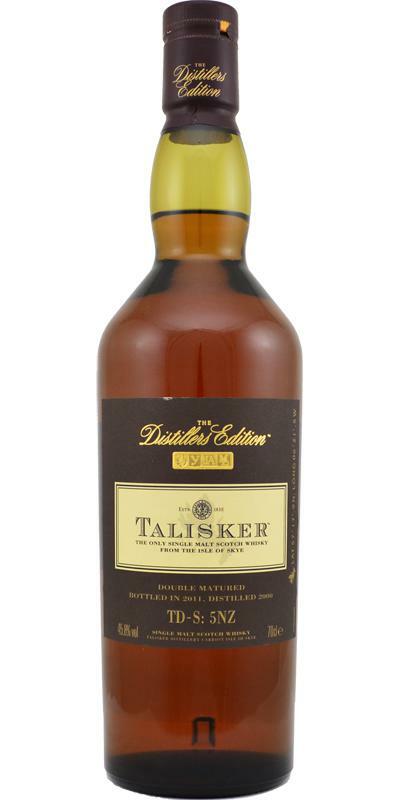 Oily, coating, maybe a tad less expressive than the nose, but especially the sherry influences, smoke, wood shavings, soft fruit are present, along with the Talisker trademark of pepper. Quite long, slightly drying on pepper, with wood smoke, hay, almonds and only a hint of fruit. Not quite as peaty as the new generation of Talisker. Rather more elegant and finely presented. Lovely stuff! Salt liquorish, raisins, some peat, lemon peal, lemon candy, mango and oregano. The nose is very clean and expressive. Medium long finish, more peat coming through here. 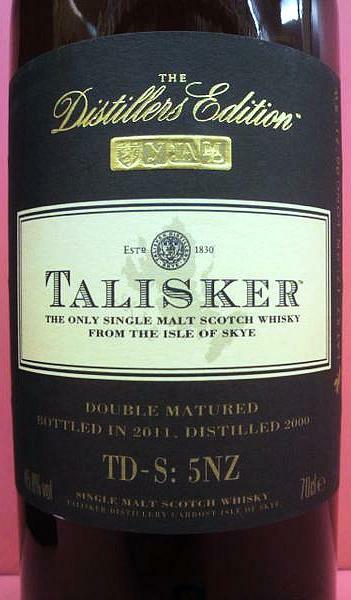 And those Ooh-so-very-Talisker liquorish notes mixed with raisins and lemon. Really pleasant finish!